Bundesliga | Jupp Heynckes' 2017/18 treble chasers: the best Bayern Munich side ever? Jupp Heynckes' 2017/18 treble chasers: the best Bayern Munich side ever? They've been in a league of their own for a good number of years, but is the class of 2017/18 the best Bayern Munich side ever? Bayern have been crowned Bundesliga champions for a sixth successive time, and 27th overall. A repeat of 2012/13's historic treble triumph is also on the cards, with the Bavarian behemoth poised to reach the UEFA Champions League and DFB Cup semi-finals - and among the favourites to win both. Back in 2013, Bayern wrapped up the Bundesliga title with a then record seven matches to spare. They dispatched the likes of Arsenal, Juventus, Barcelona and Borussia Dortmund en route to claiming their first European crown since 2001 and blew the field away in the German cup. In the words of head coach Jupp Heynckes: "FC Bayern have never played a football this modern, this attractive, this contemporary in their whole history." It's hard to disagree – even after three seasons fulfilling almost every football purist's fantasy under the possession-mad Pep Guardiola (2013-2016). The Heynckes model was different. Rather than insisting on passing teams into submission like his successor, he struck the perfect balance between defence and attack, combining a suffocating pressing game off the ball with a ruthless eye for goal on it. The record German champions - despite having usurped Heynckes' previous best-mark by becoming the first team in history to win the Bundesliga in March in 2013/14 - have scarcely played so effectively and with such consistency. Until now. In Manuel Neuer, the Reds have the best goalkeeper ever to have played the game and conceivably the most reliable understudy in Sven Ulreich, who has made 24 top-flight appearances so far this term. FIFA World Cup winners Jerome Boateng and Mats Hummels rank as two of the world's very best centre-backs, with Niklas Süle a genuine world-class alternative for a coach who knows exactly when and how to tinker. No one can hold a candle to full-backs Joshua Kimmich and David Alaba – although Rafinha gets top marks for effort and application - while Bayern's midfield is stocked to the rafters with match-winners: Thiago Alcantara, Javi Martinez, Sebastian Rudy, Corentin Tolisso and Arturo Vidal. Bayern are equally blessed in the final third. 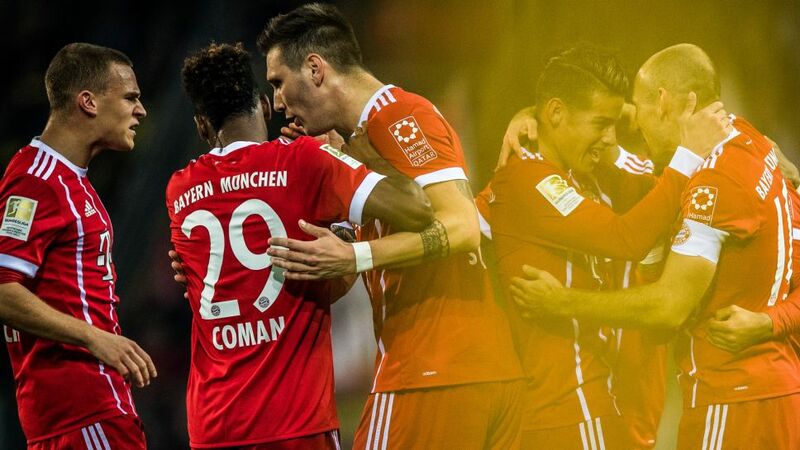 At the age of 35 and 34 respectively, wing wizards Franck Ribery and Arjen Robben are still tying up defenders in knots, with Kingsley Coman growing into the role by the week. No one has figured out how to mark inimitable forward Thomas Müller, who recently reached 200 Bundesliga wins quicker than any other player; James Rodriguez has become unplayable in the No.10 role; Robert Lewandowski cannot stop scoring; and Germany's Sandro Wagner is a proven and proverbial Plan B not seen since the days of treble winner Mario Gomez. What is more, only five of the aforementioned outfield players - Rafinha, Ribery, Robben, Vidal and Wagner - are aged 30 or over. On current form, there is every chance they will replicate the 2012/13 success; bad news for their big-name rivals for the Champions League and fellow DFB Cup contenders Bayer Leverkusen, Eintracht Frankfurt and Schalke. It's a bold claim to make with some titles still left to claim, but Heynckes' current Bayern crop are shaping up to be the best – statistically and man for man - in the club's decorated history.